We know that running a small business can be expensive, and spending money on network monitoring software is probably the last thing you want to do. So, if you have 2 or fewer resources to monitor, you can use Overseer Network Monitor to monitor your network and servers for free! All the features are enabled with no nag screens or annoying functionality limitations-- this is absolutely free network monitoring software. You are simply limited to 2 resources. In exchange for using our software for free, we do ask that you spread the word-- tell your colleagues, employers, friends, business associates, etc. about Overseer. Even better, include a link to our site on your website, showing your appreciation for this free network monitoring software. 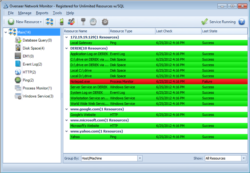 And lastly, once your monitoring needs expand beyond 2 resources, please upgrade to the full version of our software. For your free network monitoring software license, please fill out the information below and your license key will be Emailed to you, instantly. This free network monitoring software should only be used if you have 2 or fewer resources-- if you want to use Overseer Network Monitor for more than 2 resources, you can demo our software for up to 30 days and then buy a license.